Genetics- How Much Do They Matter? This is one of the most often asked questions: How much do genetics matter? If you want to be a top level athlete of any sport, it matters a great deal how gifted you are. If you simply strive to look great at the beach, that is a different story. 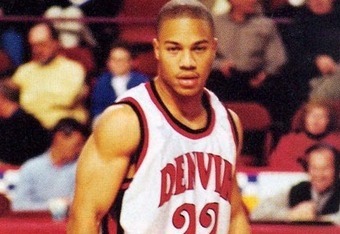 Above is Phil Heath BEFORE he ever touched a weight. Most people need to train 3-4 years to have arms and shoulders like that. Note how low his biceps inserts are… needless to say, if someone like him starts training, eating and using PEDs, you get a world champion. Someone as gifted as him also gets away with suboptimal training since his muscle activation is simply much better than that of a normal person. As an example, Phil has very low forearm and biceps insertions along with a pair of wrists that you can hit with a sledgehammer, so he will get something out of the barbell curl. You and I probably not. If you watch Arnold doing dumbbell flyes, you cringe. He stretches so low that one fears for the cuff. Did he create more fiber damage and growth this way? Most likely. Should you do it? Not so much. Ditto when it comes to diet. The genetic elite can partition nutrients way better than you and I can, meaning they can eat a bigger surplus and build mostly muscle as opposed to getting fat. By the same token, they can diet stricter without losing a lot of muscle. Yes, life is unfair. Not to take anything away from these guys, they are great athletes, but us, mere mortals, need to be aware of our limits and stick to what science tells us. 1. Drugs are not the answer. Repeat after me: if you do not have the genetics, you can take all the drugs you want; you will just get sick but not look like they do. 2. You must become the smart gym rat. Learn about anatomy, tension, exercise selection, the strength curve. If you need videos, here you are. 3. You need to learn everything you can about nutrition and tracking your calories. Again, I have met and trained/eaten with some of the genetic elite and most of them do not track their calories. Why? For one, they have an insanely fast metabolism and they are very much in touch with their bodies, so they know when to eat more or less. If I tried the same, I would be a sumo wrestler. Now before you get discouraged, ANYONE can look fantastic but we will just not be world class bodybuilders. Previous post: DOES BEING JACKED MAKE YOU HAPPY? Next post: Food As Such….